Of all the Peanuts specials, one of the most uniquely memorable was an eight-part miniseries that originally aired from late 1988 to early 1989. 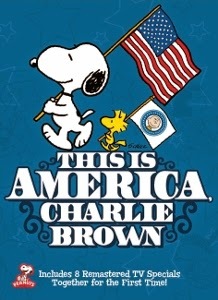 Titled This is America, Charlie Brown, these specials told the story of the United States from the perspective of Charlie Brown, Snoopy, and the rest of the gang. While some purists cried foul over the inclusion of adult characters (speaking in “normal” voices, rather than the muffled trombone sounds so familiar from the other specials), This is America is a terrific piece of educational entertainment. For the first time in years, all eight episodes are back in print and presented together as a single two-disc collection. In terms of pure running time, this offers an exceptional value when considering that most individual Peanuts reissues only include a pair of 24 minute specials. Here the total running time is well over three hours. Kudos to Warner Bros. Home Entertainment for putting this out as a single volume instead of piecemealing them, two episodes at a time, over several releases. Some of these episodes focus a little heavily on long monologues delivered (over historical montages) by one of the gang, be it Linus or someone else. The specials work best when they get imaginative, such as the gang interacting with Orville and Wilbur Wright as they prep for their maiden flight in “Wright Brothers at Kitty Hawk.” In “Music and Hereos of America,” a nice balance is struck between early styles of American music, covering everything from Stephen Foster to John Philip Sousa to W.C. Handy. In a particularly poignant moment, special tribute is paid to the late Vince Guaraldi, the jazz pianist famous for scoring 17 Peanuts specials, including the classic theme “Linus and Lucy” (Guaraldi died in 1976).